While chiropractic care can be useful for people of all ages, it may be especially beneficial to senior citizens. As people age, the bones and muscles in their bodies can weaken, which can lead to poor posture and chronic pain. In addition, the discs that act as cushions between spinal vertebrae can dehydrate and stiffen over time. When the outer layer of these discs begins to bulge, pain and difficulty moving can result. Elderly people may have trouble doing everyday activities due to these issues. Seniors who opt for chiropractic care can improve their spinal alignment and overall health. The chiropractors at Taylor Rehabilitation and Wellness Center have significant assistance helping seniors relieve some of the pain and challenges associated with the aging process. 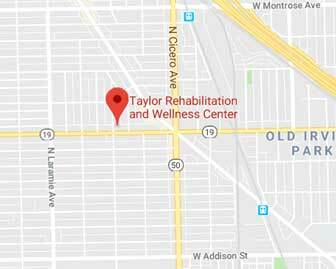 Seniors can receive both chiropractic care and bulging disc treatment in Chicago, Illinois at the Taylor Rehabilitation and Wellness Center. Seniors who experience chronic pain in their joints or muscles may have trouble getting out of bed some mornings. A chiropractor can treat the source of the pain through spinal manipulation and other natural treatments, including bulging disc treatment in Chicago, IL. This way, seniors don’t have to resort to prescription pain medications. Thee medications don’t treat the root cause of the pain and can be highly addictive. Seniors who have abnormalities in their spine may have trouble moving around like they used to. A skilled chiropractor can increase their range of motion after just one or two chiropractic adjustments or bulging disc treatment in Chicago, IL. Elderly people with an increased range of motion can do many more things, such as gardening, picking up their grandchildren and clean the house, without feeling pain. Unfortunately, falls are quite common in the elderly. Seniors who have poor strength and flexibility in their joints are more likely to fall and get seriously injured. Attending regular chiropractic sessions, however, can dramatically reduce the risk of these falls. A chiropractor can repair abnormalities in the spine and prescribe stretching and strength exercises to perform at home to decrease the risk of falling. When elderly people become very weak and unable to take care of themselves, going to a nursing home may be an appropriate option. However, most seniors value their independence and would like to stay in their own homes as long as possible. Chiropractic care and Chicago, IL bulging disc treatment can strengthen their joints and ligaments, so seniors may be less reliant on nursing home care. They may be able to move around freely by themselves and stay in their homes for a long time. Chiropractic care doesn’t just provide physical benefits for seniors. They can also gain many mental benefits as well. When seniors are able to move around more freely and do the activities they love, they may develop a new zest for life and enjoy getting up every morning. If you are seeing a chiropractor for the first time soon, you might not know what to expect. The first thing your chiropractor will likely do is ask you about your medical history and what brings you in. It’s important to answer the questions with as much detail as possible. Then, your chiropractor may run some tests to determine what’s wrong and then decide on the appropriate treatment. If you are an older American and are suffering from pain in your joints, neck or back, please consider scheduling a chiropractic consultation or bulging disc treatment in Chicago, IL at the Taylor Rehabilitation and Wellness Center today.